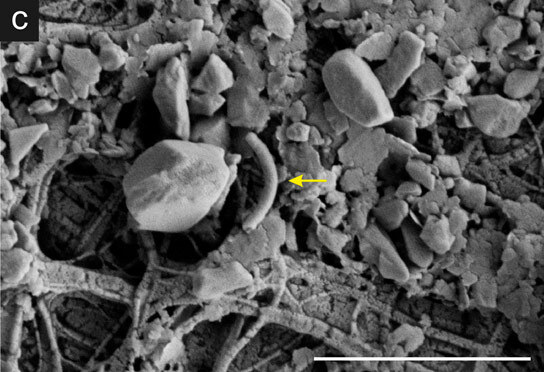 The microorganisms that came out of Subglacial Lake Whillans were “incredibly diverse,” and the microbial cells came in a variety of shapes. The yellow arrow points to a rod-shaped cell as seen through a scanning electron microscope. (Image courtesy of WISSARD). Researchers from the WISSARD project have discovered an active ecosystem of microorganisms that live beneath the Antarctic ice sheet, converting ammonium and methane into the energy required for growth. Bozeman – The first breakthrough paper to come out of a massive U.S. expedition to one of Earth’s final frontiers shows that there’s life and an active ecosystem one-half mile below the surface of the West Antarctic Ice Sheet, specifically in a lake that hasn’t seen sunlight or felt a breath of wind for millions of years. The life is in the form of microorganisms that live beneath the enormous Antarctic ice sheet and convert ammonium and methane into the energy required for growth. Many of the microbes are single-celled organisms known as Archaea, said Montana State University professor John Priscu, the chief scientist of the U.S. project called WISSARD that sampled the sub-ice environment. He is also co-author of the MSU author-dominated paper in the August 21 issue of Nature, an international weekly journal for all fields of science and technology. 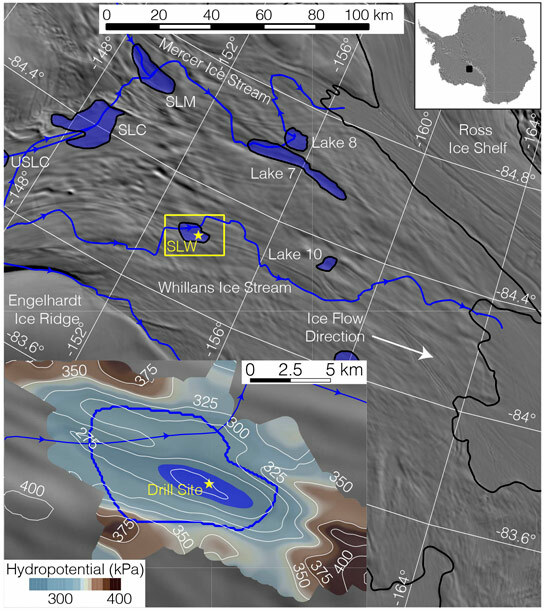 This map indicates the drill site on the West Antarctic Ice Sheet where researchers discovered an active ecosystem one-half mile below in Subglacial Lake Whillans. (Image courtesy WISSARD). Be the first to comment on "Researchers Discover an Active Ecosystem One-Half Mile Below Antarctic Ice"